Sylveco is known for use of cold pressed, raw vegetable oils, waxes and vegetable extracts with medicinal and conditioning properties in its products. The cosmetics from Sylveco do not contain artificial colourants or fragrances as well as sensitising preservatives or a derivative of crude oil. What is more, they are deprived of thickening substances and stabilizers, which can weight skin down and clog pores. One of cosmetics worth of recommendation is flax hair mask with addition of coconut oil. 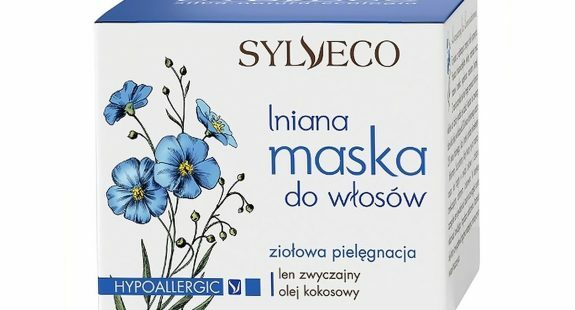 Hypoallergenic hair mask with flax from Sylveco is dedicated in particular for dry and brittle hair. Properly selected hair mask components allow quick hair recovery, improvement of their appearance and overall health. It is thanks to content of coconut oil, which seals hair cuticles, protects them against unfavourable impact of high temperatures (including the Sun and hot air). Coconut oil is one of the most popular oils for hair care mainly due to the fact that it perfectly protects hair. The base for hair mask is flax seed extract with content of mucous membranes covering hair with protective layer, thanks to which strands remain smoother and protected also on the outside. Regular use of hair mask with flax from Sylveco makes hair gain elasticity, become protected from the roots and stop split ends. Hair mask makes combing easier after the shower and causes hair to be soft in touch, glossy and silky. 1. Before hair wash as a hair compress – then it works as a band-aid for damaged hair. In aim to do that apply mask on dry hair and leave it on for about half an hour. Best is to additionally wrap hair with a towel. 2. After hair wash, on damp hair apply hair mask for 2 minutes then rinse it with water. Hair mask can be used after every hair wash if their condition requires so. Content of coconut oil makes strands easy to comb and after drying also easy in stylisation. Hair mask Sylveco has volume of 150 ml/5.1 oz. Frequent use makes product does not last for a long time. It is however worth to try it because effects are spectacular.